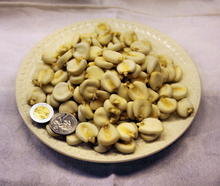 Dried (uncooked) form of hominy (US quarter and Mexican one-peso coins pictured for size comparison). Hominy is a food produced from dried maize (corn in the U.S.) kernels that have been treated with an alkali, in a process called nixtamalization (nextamalli is the Nahuatl word for "hominy"). Hominy is made in a process called nixtamalization. To make hominy, field corn (maize) grain is dried, then treated by soaking and cooking the mature (hard) grain in a dilute solution of lye (sodium hydroxide) (which can be produced from water and wood ash) or of slaked lime (calcium hydroxide, i.e. from lime (material), as in limestone, not from lime (fruit)). The soaked maize is washed. Alkalinity helps dissolve hemicellulose, the major glue-like component of the maize cell walls, loosens the hulls from the kernels, and softens the corn. Also, soaking the corn in lye kills the seed's germ, which keeps it from sprouting while in storage. Finally, in addition to providing a source of dietary calcium, the lye or lime reacts with the corn so that the nutrient niacin can be assimilated by the digestive tract. People consume hominy in intact kernels, grind it into sand-sized particles for grits, or into flour. In Mexican cooking, hominy is finely ground to make masa. Fresh masa that has been dried and powdered is called masa seca or masa harina. Some of the corn oil breaks down into emulsifying agents (monoglycerides and diglycerides), and facilitates bonding the corn proteins to each other. The divalent calcium in lime acts as a cross-linking agent for protein and polysaccharide acidic side chains. Cornmeal from untreated ground corn cannot form a dough with the addition of water, but the chemical changes in masa (aka masa nixtamalera) make dough formation possible, for tortillas and other food. Previously, consuming untreated corn was thought to cause pellagra (niacin deficiency)—either from the corn itself or some infectious element in untreated corn. However, further advancements showed that it is a correlational, not causal, relationship. In the 1700s and 1800s, areas that depended highly on corn as a diet staple were more likely to have pellagra. This is because humans cannot absorb niacin in untreated corn. The nixtamalization process frees niacin into a state where the intestines can absorb it. This was discovered primarily by exploring why Mexican people who depended on maize did not develop pellagra. One reason was that Mayans treated corn in an alkaline solution to soften it, in the process now called nixtamalization. The earliest known use of nixtamalization was in what is present-day southern Mexico and Guatemala around 1500–1200 BC. In Central American and Mexican cuisine, people cook masa nixtamalera with water and milk to make a thick, gruel-like beverage called atole. When they make it with chocolate and sugar, it becomes atole de chocolate. Adding anise and piloncillo to this mix creates champurrado, a popular breakfast drink. The English term hominy derives from the Powhatan language word for prepared maize (cf. Chickahominy). Many other indigenous American cultures also made hominy, and integrated it into their diet. Cherokees, for example, made hominy grits by soaking corn in a weak lye solution produced by leaching hardwood ash with water, and then beating it with a kanona (ᎧᏃᎾ), or corn beater. They used grits to make a traditional hominy soup (gvnohenv amagii ᎬᏃᎮᏅ ᎠᎹᎩᎢ) that they let ferment (gvwi sida amagii ᎬᏫ ᏏᏓ ᎠᎹᎩᎢ), cornbread, dumplings (digunvi ᏗᎫᏅᎢ), or, in post-contact times, fried with bacon and green onions. Hominy recipes include pozole (a Mexican stew of hominy and pork, chicken, or other meat), hominy bread, hominy chili, hog 'n' hominy, casseroles and fried dishes. In Latin America there are a variety of dishes referred to as mote. Hominy can be ground coarsely for grits, or into a fine mash dough (masa) used extensively in Latin American cuisine. Many islands in the West Indies, notably Jamaica, also use hominy (known as cornmeal or polenta, though different from Italian polenta) to make a sort of porridge with corn starch or flour to thicken the mixture and condensed milk, vanilla, and nutmeg. Look up hominy in Wiktionary, the free dictionary. ^ Thigpen, Susan (October 1983). "Hominy - Mountain Recipe". The Mountain Laurel. Retrieved 17 November 2013. ^ Fussell, Betty H. (1992). The Story of Corn. UNM Press. p. 204. ISBN 9780826335920. ^ Carpenter, KJ (1983). "The relationship of pellagra to corn and the low availability of niacin in cereals". Experientia. Supplementum. 44 (44): 197–222. PMID 6357846. ^ Galiano, Amanda. "Southern Slang: G-P". About.com. Retrieved 17 November 2013. ^ "Hominy Soup #3 (Gv-No-He-Nv A-Ma-Gi-i)". Native Way Cookbook. Wisdom Keepers, Inc. Archived from the original on 26 April 2009. Retrieved 17 November 2013. ^ "Dumplings, Lye (Di-Gu-Nv-I)". Native Way Cookbook. Wisdom Keepers, Inc. Archived from the original on 2 November 2000. Retrieved 17 November 2013.